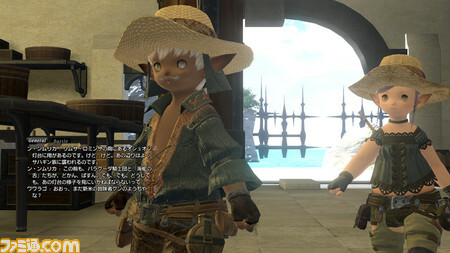 Coinciding with the start of the Final Fantasy XIV alpha test, Famitsu.com was given a chance to quiz the development staff on a variety of game issues. Here's a summary of the Q&A. The staff first shared a rough schedule for the game's alpha and beta programs. three days a week, with each session lasting about four hours. These tests will be conducted in Japan, North America and Europe, each region separate from one-another. the alpha, but will have multiple worlds running in parallel. There will be some adjustments made in the switch from alpha to phase 1 beta that will require them to do a data wipe. After they've adjusted the game to fix problems and reflect the opinion of test players, they'll move to beta phase 2. From here, the game will run 24 hours. The content of the game used in this beta will have changed considerably and will be closer to that of the final game. The PS3 version of the beta test will begin here. Phase 2 will gradually expand with additional worlds as the staff runs load tests on having hundreds of thousands of simultaneous connections. The final service-in for the game will come following a few weeks of open beta testing. The current alpha test version of the game limits play to just the Limsa Lominsa city-state and its surroundings. This will be the case throughout the alpha and beta tests. You won't be able to access the rest of the world until the final version. Limsa Lominsa and its surroundings account for less than 1/5 of the final version's full world, according to the staff. FFXIV lets you input both first and last names for your character. The reason for this is that each world will allows multiple players to have the same family name or same first name -- although two players can't have the same pairing of first and last names, of course. This will give players a chance to more easily play using the name of their choice. When using chat, there's a system in place that will make it so that you won't have to input the full name. What kind of differences can you expect when starting in a different country? Each country will have a different story. Additionally, each city will have different facilities and unique atmosphere. There will be combat-loving monsters who attack you. Additionally, there will be powerful enemies unrelated to the scenario for players to go after. None of this is in the alpha. Square Enix has been allowing sites other than Famitsu to share their impressions on the alpha as well. 4gamer delivered its own set of impressions, complete with a bunch of screens (some of which you see on this page). See their article here. :o if u offer it to me for money ill toss u the little card that says "do not pass go go directly to jail"
monopoly prison isnt like irl prison so no bishes for u. jst a shoe sitting ont eh guys face behidn the bars. Pfft, that's why I don't like monopoly! Also, that Lalafel has facial hair :D I'm happy now. I like that they have the option for them to have facial hair. Though that particular style would not be my personal pick out of all the sliders. Angry vid game nurd explains perfectly how i feel about that crap. SE has a huge team of internal testers and/or professional paid testers they use instead. FFXI was all but entirely internally tested besides a very short friends and family beta in Japan before its original release. I and many others were quite surprised that SE were doing a closed beta with outside testers, and heck even an open beta. Only having 1/5 of the world avail to testers I love cause only that bit of info will be getting leaked. The rest will remain mysterious and unknown which is a very good thing unlike most MMOs where everything is known before its released...like WoW for example. All the bosses, items, everything are known by all players how to beat them, what you get, how to do everything, and then these same players that watch that crap start whining a few days later that is was all so easy and they're done and pining for more content.